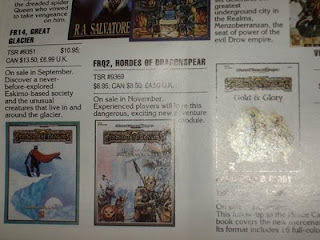 I mentioned these briefly before. But, John Four has collected some great stuff over at the downloads section of the Roleplaying Tips website. I decided they deserved own post and more exposure. A grab bag of goodness, overland encounters, book generator, 8000 first names, excel spreadsheets, and the like. Also, awesomely, Roleplaying Tips Archives - plain text format - Issues 001 to 431 a 4.7MB zip file. Not linking them all, head over to Roleplaying Tips Website's Download Section and scroll down. 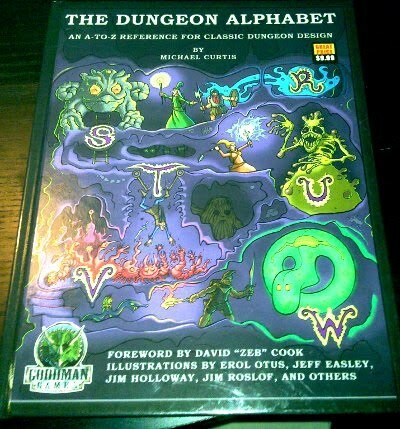 Before the One Page Dungeon Contest, there was the Five Room Dungeon Contest. These are all smallish (5 rooms) adventure settings based on the 5 Room Format. Free RPG Day is sneaking up on us once again! Manufacturers like Paizo, Wizards of the Coast, Fantasy Flight Games, Mongoose Publishing, WizKids/NECA, White Wolf Publishing and many more provide free samples of their best games and retailers like Dragon's Lair Comics & Fantasy® run game demos, giving new players a chance whet their palate for the amazing gaming experience tabletop RPGs can provide and giving veteran players a chance to test out new games. This is a great chance to discover the world of role-playing games - or re-discover them and to share your love of the game with new players! Other than Shard which I demo'd last year, "meh" is the strongest emotion that list brings. I don't see anything listed in their calendar. They don't feel they have the room to support in store gaming (Although, I could squeeze me and four players in that front space). So, I kind of doubt they are doing anything either. Sad, cause S. Austin needs a place to game. 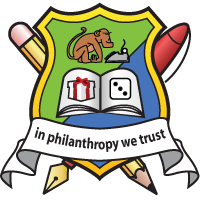 Any other Austin / Central Tx stores doing stuff for FREE RPG DAY? Last year there was a small social (non-gaming) gathering of those with an "old school" inclination/interest. It was fun. Been thinking it's time for another one, but this time with games. Found out at NTRPGCon I am not the only one thinking such thoughts. Seems there is a cadre of Dragon'sfooters conspiring to hold a multi-weekend mini-con in Austin. They are currently discussing the "when". Late July through earliest Sept are the current canidates. You can vote for dates in that thread. 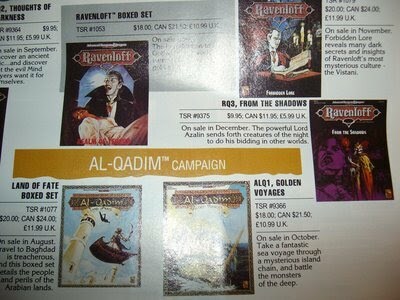 every campaign I've made since seeing this sometime in the 80's. My boss has been interested in playing some D&D with his two boys (10-12 age range). He's asked me various questions about running games and the like. [It's very enlightening and refreshing talking with an "empty mind". To him it's just D&D, full stop. Not a jillion of editions, old/new school, sandbox/storypath, etc/deadhorse.] I purposefully was not edition evangelizing (Although, I was totally evangelizing RPGing in general. Mentioning the several bloggers posting about great times gaming with their families). A couple weeks ago his kids cornered him and got him to run an encounter with the 4ed (intro set?) they had. The Joy of Play was experienced by everyone. But it was a short session and all involved craved more! My boss and his sons had a blast. He's been talking about it all week. Has downloaded and printed S&W manual, monster collection, character sheets, and asked me for intro modules. [I struggled to find S&W specific, free, intro modules, wtf? I gave him B1 and a copy of OD&Dities #12 which had "Ruins of Castle Vendegaar" by Robert Adkins. Thanks Robert!] He wants to play D&D on long road trip. I told him friends don't let friends DM and drive. I was kind of bummed Jimm ran his game when I was running something and couldn't join in the fun. But, I believe he'll be running Skull Mountain as a continuing "campaign", booh yah! So, all you Austin area old-schoolers (and I know there's a few of you) that haven't been coming to D&D meetups thinking it's all 4ed. You're on notice. 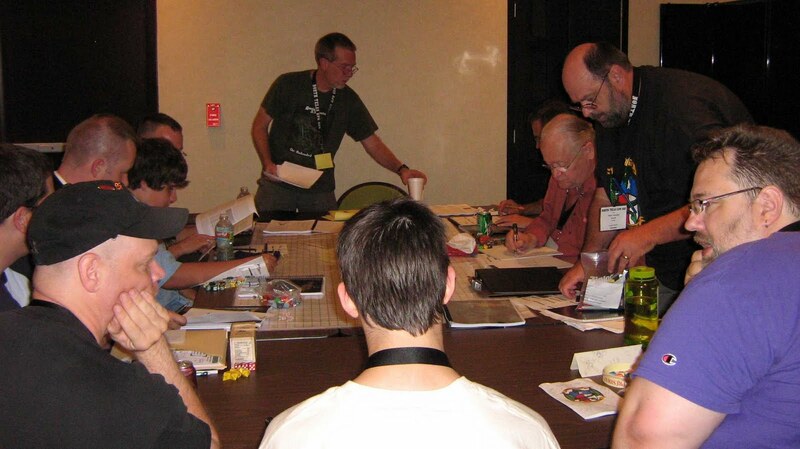 Kick those kids off your lawn early so you have time to attend the Austin D&D Meetup. There's now a S&W ongoing game, several 1st / 2ed ongoing games, and I'll run Labyrinth Lord on demand. We also have space for more DMs, bring it. Jimm Johnson's irresistible game blurb. Two days north of the last outpost of the Sparn Empire, through the cannibal haunted jungles of Brool, across the piranha teeming river, a great boulder-strewn crag rises from the mists. An enormous, leering reptile skull sits atop the rugged formation. Some say the skull is an odd natural formation, while others insist it is the petrified remains of some primordial unhuman god. Whatever its origins, the whispered tales of Skull Mountain all agree on one thing: incredible treasure and unmatched glory await those bold and foolish enough to penetrate the mountain, unravel its dark secrets, and brave its untold dangers. Of course such treasure and glory will only accrue to those who can return alive! Here's a bit from "A Brief Word From John" I wanted to highlight. The text archives are great. There's also a downloads sections with 22 focused supplemental issues and a bunch of other downloads. AND the 5 room dungeon collection. RPGTW Downloads. John's parting message is one we should all take up. Get at least one game played this week! 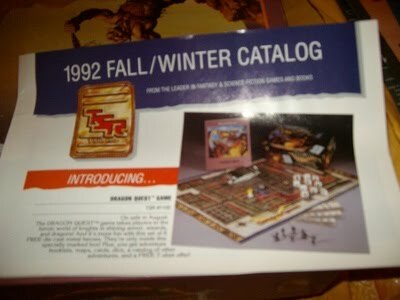 Look at how many different settings TSR was supporting/pushing in '92! Lack of focus much? 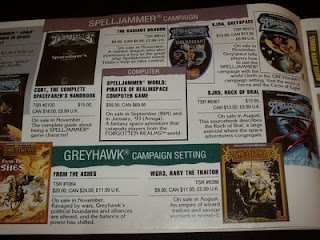 The should have used SpellJammer / portals to link up all their settings into one connected mega setting with support for transferring characters between them. But, I suppose the "epic" scale, "serious" campaigns Dragonlance and later-day Forgotten Realms couldn't handle anything that awesome. Character background is what happens between levels one and six. Got no reference, maybe he never said it, doesn't matter to me. I'm not like omg Gary said it so it must be awesome!!! Rather it succinctly nails how I think about sandbox campaign characters. [although I'd say one through four since 9th lvl is my high end] Who you are, where you're from, what you've done are not as important (or as interesting) as what are you gonna do next? We play the game to discover the answer to that question. The most interesting character's history is built in game. Hmmmm, I like that "what are you gonna do?" Good definition/delineation/explanation of a sandbox/rulings/seat of pant DM to new players. DM's the guy/gal who asks you "What are you gonna do?" With the follow on implication that once you tell them, they then figure out what it means / how it works out. Others I've recently added to my collection of quotes. Booty may have different meanings in different places, but it's all the same to Conan. Me early on: Whats the goal of the adventure? Why are we here? Them: Gold, treasure, and to kill the minotaur king/Beastlord. Me: Why are we killing him? Them: Because he's the guy on the cover of the module! This is meant for mass of goblins swarming and brigining down Sir ThinksHe'sAwesome and maybe for grabby monsters like crabs and octoterrapuses (land octopie). Not for ju-jitsu, wresting, or other mostly mano-a-mano unarmed combat. I'd just use normal combat for that. When hit points gone you got a knee-lock or whatever. The strong man throws off buch of piled on grapplers trope. Different than regular combat, specifically freaking avoid non-leathal damage/hitpoints. Make weak, low level creatures a threat when swarming. Fit in with 1 attack roll, multiple damage dice, all attacks do d6 themes of my other house rules. Simple / vague enough to allow on the spot rulings for unusual situations. Grappling is not effective when target has something sharp to poke you with. That is until there are enough attackers target can't poke them all fast enough. 2x the normal number of attackers may grapple a target. Ungrappled defender (with weapon in hand/natural damage) negates up to BAB grapplers. If all grapplers negated there is no grapple, attackers are kept at bay (and wasted their action looking for opening). Alternatively grapplers can force their way through but then defender gets automatic 1 damage die vs each (up to BAB targets). All attackers combine into one to-grapple attack. Attack roll gets +1 per attacker. If attackers are "natural" or "trained" grapplers also add (avg/highest/lowest) to-hit bonus to attack roll. Attackers must roll to-grapple every round. On successful hit all grapplers add their grapple damage dice rolls to Pin Total. If they choose to attempt to break free, a grappled defender auto-hits and subtracts their grapple damage dice roll from Pin Total. Is based on size but some creatures (crabs, boa constrictor) may have fixed amount. Tiny 1pt, Small 1d4, Man-sized 1d6, Large 2d6, Huge 4d6, etc. Extra dice (1 per Str mod) are only given to defender. Ex. a Str 18 man gets 4d6. Depending on size of "pile" one can shoot/whack attackers without much danger of hurting defender. Alternatively ally can "dive in" and subtract the roll of their grapple damage dice from defender's Pin Total. No to-hit required. Base Attack/to-hit Bonus what they get for class/level not including magic, buffs, stats mods, etc. 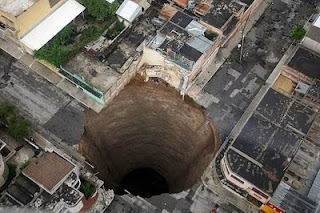 The recent (although I swore I saw this photo long ago*) big hole in Guatemala and Purple Worm Post got me a thinking. I'm partial to huge fantasy cities. Places like Ptolus, Alexandria or Constantinople analogs, CSIO, and the like. Lots of adventure, weirdness, and debauchery to be had. It's a nice change of pace/action from being way off on the edge of civilization in some po'dunk Keep on the Borderlands. 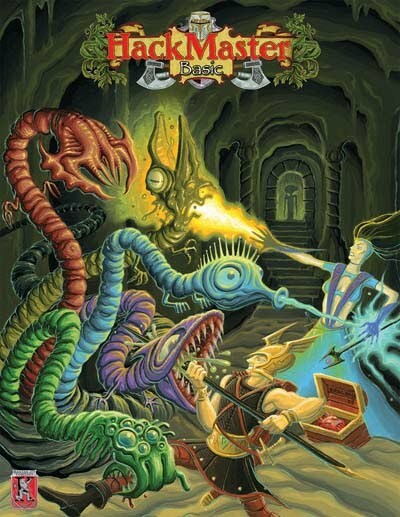 But, eventually I get the hankering for some down and dirty megadungeon exploration and monstrous beasts. 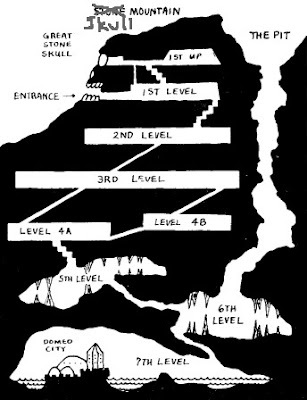 I've never been able to the idea of mad wizards castle/dungeon just outside of town, or "it's catacombs and forgotten dungeons all the way down" and all these fantastic monsters have had absolutely no impact on the city full of tasty civilians but 1st level characters can come and go as they please, or other even lamer "dungeon next door to city" hand-waves. This one is no less arbitrary but some how I like it better. 50' wide Purple worm bursts through surface, rampages, kills thousands, devastates an entire district of the city, takes days to kill, an epic battle that claimed many of the region's greatest heroes. Now, weeks later, initial exploration has revealed extensive tunnels deep withing the gapping hole left by the worm. Authorities are calling for new heroes to step forward and explore these depths. To determine if more of these purple monsters or worse threaten the city. Having little time or interest in babysitting miserable far flung hamlets such as yours, Bordertown, Good King Osric has proclaimed that all able bodied men and those stout framed women who so desire shall henceforth be formed into militias charged with protecting the Kingdom's villages from orcs and other miscreants. 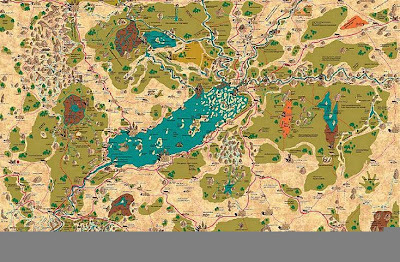 Report to your drillmaster, Sir Geant, on Sunday, June 13th, 12:30pm at BattleForge Games, Austin, TX. A Hackmaster Basic introductory adventure. You're in the Militia now! "What Militia?" you say? Who cares! The point is you get to kill stuff! More specifically, you get to hack the enemy to pieces using Hackmaster, a version of D&D with all the wuss parts removed. A preview of what's in store, here's a PDF comic illustrating combat: Knights of the Dinner Table. Damn fun, Thurs through Sunday fun. Many game conventions I get a little bored or a lot tired and end up leaving early Sunday or skipping it altogether. Not this time. NTRPG is a small con, by the 2nd/3rd day people were calling me out by name (which made my poor memory for names even more embarrassing). Despite the smaller size NTRPG is packed with great people and great games. I played in seven and each one was good if not great. DM'd by Rob Kuntz, Allan Grohe, Matt Finch, Jason Cone, and Jon Hershberger. Yeah, great. I'd play with any of them again. Any time. Any place. Also attended great panels on Megadungeon Design and Early Days of the Hobby (post more on those later). Some pics (not mine) found via The Contemptible Cube of Quazar (one of many I met at the con). Definitely will be going back next year. decked out in purple, the real Father Brian middle left. Playing in one of the later sessions of con "campaign" Mythrus Tower with a LARGE group of 11 players. Hunched over his S&W fighter character sheet discussing tactics with the party leader was an older silver haired gentleman, Dennis Sustare. I couldn't really hear what was said but suddenly his eyes twinkle, his lips erupt into a huge grin, and his face is awash with laughter. I have no idea but can't help but feel that at that moment -- However many years this man has been alive washed away. He was a child again with a child's imagination enjoying a game of make-believe. In fact, he has never "grown up", never lost the joy of play. That, for me, is the point of RPGs. Why I play them. Why I bother to introduce RPGs to others and attempt to expand the hobby. Moments like those. To create them, share them, and experience them. To bring a smile to a child's face whether that child is 12 or 89. Here's to the Joy of Play, may it keep us all forever young of spirit! Another session of RedBox BCS is planned for June 20th. Roleplaying Tips Weekly E-Zine Issue #491 is out! Johnn is looking for tips on GMing cities for an upcoming issue. When Players Cheat -- better advice than mine, "killem". The Power of Organization -- GM advice for keeping it all straight. 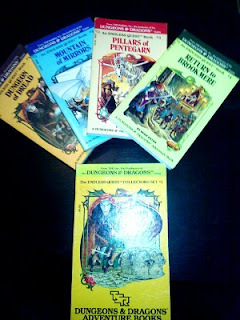 My gamer budy found RPGs late in life. Not playing any until adult hood. He's on a bit of a quest to make up for lost time and explore what he missed. So, for his belated birthday gift I got him a bit of old old-school and new old-school. 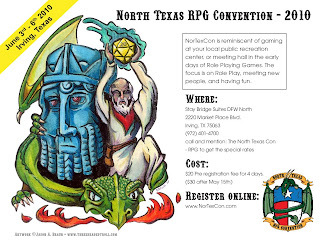 See you at North Texas RPG Con! Aggregating ideas from numerous sources and going down crazy rabbit hole... Is this even D&D anymore? Does it matter? at most 1 attack per round, preferably 1 die roll. run a sub 9-12th level, low "power" game. STR/DEX do not normally provide to hit/damage/AC bonus. 1hand weapons do d6 damage. 2hand weapons do d6 + STR mod damage. two weapons do d6 damage, add DEX mod to the single attack roll. Crossbow do 2d6(take best), doubles are critical/cool effect. I very much like how 2hand requires strength and dual wielding requires dexterity to garner benefit. The all weapons do d6 is fallout from "hit points are not physical" and desire to not penalize rp choice of hammer over ubiquitous (cause mechanically it best) long sword. Instead of adding bonus tohit/dam, +X weapons increase damage die size. d6 -> d8 -> d10 -> d12. +3 max. Conversely creatures that required +X weapon to damage instead reduce damage die d12 -> d10 -> d8 -> d6 -> dNothing (immune). A sword of Slaying Foo would do d20 damage against Foos! There are three levels of armor with increasing movement penalties and minimum strength requirements; Light AC8, Medium AC6, Heavy AC4. There is actually a fourth Plate AC2, but is so rare/expensive it's not regularly available "equipment". Instead of AC bonus +X magic armors (and other +X AC magical effects) provide a save. High dexterity provides armor like protection rather than adding to AC. Dex 13-15(+1) AC8 equivalent to Light armor. Dex 16-17(+2) AC6 equivalent to Medium armor. Dex 18(+3) AC4 equivalent to Heavy armor. Pure Fighters have a couple talents unique to them. "Melee Master" -- Melee weapon damage dice explode. "Slaughterhouse" -- When in melee with opponents who are all less than your level gain X damage dice where X is "your level" - "highest opponent level". Damage dice may be assigned (before roll) to opponents that are close. One die per target, all targets get one die before any get two. It is assumed fighter is hacking their way through this fodder and thus can reach enemies who aren't directly adjacent. Likewise other classes have some unique talents. For example, the Scout/Archer class has the unique talent "Marksman" -- Missile weapon damage dice explode. Then there are talents available to all (like 3.x feats, one of many options characters can select from every 1/2 level). "Archer" -- Bows do 2d6(take best), doubles are critical/cool effect. "Errol" -- Light armor provides AC6(medium). "Flynn" -- Requires Errol. Light armor provides AC4(heavy). "Bloodlust" -- After dropping opponent, roll free attack against close opponent. "Backstab" When attacking a completely unawares opponent, damage die explodes >= half. So, e.g. 4-6 on d6 and 7-12 on d12. "Disarm" When maximum value on damage die rolled may forgo dealing damage for attempt to send your foe's weapon clattering across the floor . Success if rerolled damage die + Str mod or Dex mod > opponents to-hit bonus. Finally, some combat options are available to all no "talent" required. "Charge!" if you can move at a jog or better and have room to charge then get to attack after move. "Reckless Assault" -- Attack single target and take best of two attack rolls. But suffer limited defense, anyone who attacks you also gets best of two attack rolls. "Called Shot to the Nuts" -- Take worse of two attack rolls. Normal damage and/or special effect depending on attacker's intention. Used to leave permanent mark "Zorro", cut above eyes (-2 to actions), hamstring (1/2 movement), sever tentacle, cut rope, target vulnerable spot (double damage), to shoot arrow into apple on head, etc. Lots of other bits; Shattering Shields, Shield Walls, hit points aren't physical, Death & Dismemberment, Lucky Number, special weapon effects (flails negate shield bonus, pole-arms have reach, etc), non-martial types use d4 damage die, et "holy fantasy heartbreaker batman" cetera. Replaced +X modifiers, damage multipliers, multiple attacks, other with changing die size, exploding dice, multiple damage dice, and roll twice take best/worst. What's the point? So, will remembering fighter's but not scout's damage dice explode, and called shot is 2d20(take worst) rather than -4 to hit, and so on take just as much time and effort as remembering and adding up bonuses? Even if so, one of my goals is alter player perception/behavior, reduce power-gaming, get them thinking "better" isn't more +x modifiers but rather tactics. Still, need to review, simplify, and reduce number of different systems (aka refactor). Just so there's no confusion, no one has asked me to pimp anything. These will always be products which I own a copy of, believe deserve exposure, and believe maybe worth your time/money. The pimping idea totally stolen from The Underdark Gazzette. Hopefully I'll remember to change it every week. 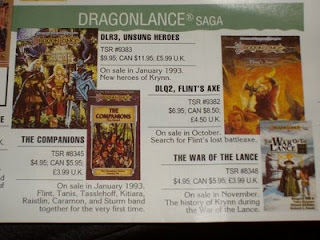 I own Arduin Eternal, and The World Book of Kas. 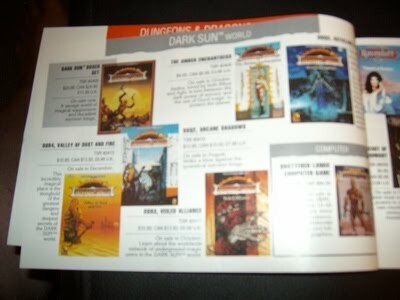 And have recently ordered the Arduin Map and the Megaset of Arduin Grimoires. 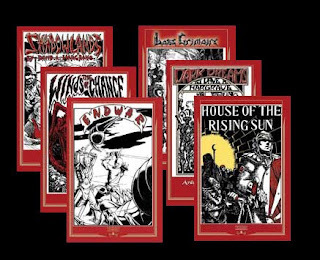 Which includes the three Classic Arduin Grimoires in a hard cover bound set, the five Hargrave authored in the 80's, one new one from Emperor's Choice. If the planet's align I might stop buying stuff and actually get to reviewing some of it. In initiative order all sides complete each phase before anyone goes onto next phase. Each character may act in only one phase. In other words a character can do one thing and one thing only per round. "Thing" being move or attack or cast spell or something else such as use wand, drink potion, flip table over and use as cover, etc. Ranged Attacks: Option to "fire" in phase 1 thus pin-cushioning the silly knights before they charge. Or to hold fire until phase 3, a sort of "opportunity fire". Waiting to see who's threating who or what targets are left standing. Movement: Standard move distance is 30'. Charge, rather than provide to hit/damage bonus is an exception to "act in only one phase". Charging allows move in move phase and melee attack in same rounds attack phase. Initiative order is preserved so if you win initiative you might be able to whack charger before their attack. Seems fast and fluid. Compatible with group or individual initiative. Fewer "moving parts" and "do only one thing" should make player turns shorter and thus reduce how long each player sits waiting until it's there time to do something. Getting things done with "we go / they go" and ability to do only one thing will require strategery. Rather than just running up and bopping wizard on head, will have to combine initiative with encircling/chasing down spell boy. At least I think it will be like that. Jonesing to try this out!